DAPI (4',6-diamidino-2-phenylindole) is used extensively as a nuclear stain that binds strongly to A-T rich regions in the minor groove of double-stranded DNA. The blue fluorescence increases 20-fold when DAPI binds to dsDNA. 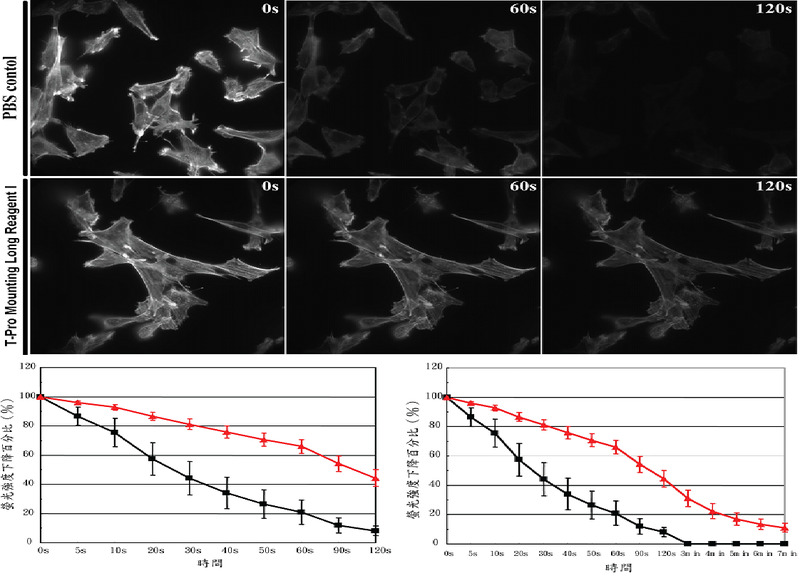 Since it can pass through cell membrane, DAPI can be used to stain both live and fixed cells, but much higher concentration has to be used for live cells as its permeability for live cell membrane is dramatically less. highly efficient and effective DNA transfection of eukaryotic cells. lines, including difficult-to-transfect, suspension, and primary cells. This transfection reagent is perfect for any of your transfection needs. Store at 4ºC. Do not freeze. 293 cells transfected with GST minigene, 26 kDa. 293 cells transfected with GFP minigene, 30 kDa. micron filtered and is tested for sterility. 0.2 micron filtered and is tested for sterility. added to cell cultures at a maximum concentration of 10ml per litre of medium. This product is stored at -20oC. At 37oC, it is stable for up to 7 days. At 2-8oC, it is stable for up to 3 weeks. Avoid freeze-thaw cycles. and is stable for 2 years. This product is stored at 2-8oC and is stable for 2 years. product is stable for 2 years at -20°C . streptomycin (base) per mL in WFI water. It is supplied as a 0.22 μm-filtered, 100X frozen liquid. ml of basal medium, yielding an iso-osmotic solution at final dilution. This product is stable for 2 years at -20oC. product is stored at 2 -8°C . stable at 37oC for five days. This product contains 50 mg/ml of active gentamicin sulfate in WFI water. It is 0.2 micron filtered and is tested for sterility. working concentration of 50 μg/mL for eukaryotic cell culture and 15 μg/mL for prokaryotic cell culture. This product is stored at 2-8oC. At room temperature, this product should be consumed within two days. It is stable at 37oC for five days. virus, cytopathogenic agents, and hemoadsorbing agents. may occur upon thawing. This does not affect the performance of this product. 10EU/ml and a maximum hemoglobin level of 20mg/dl. indicative of the extent of small molecule removal, has a maximum of 5mg/dl. virus, reovirus, cytopathogenic agents, and hemoadsorbing agents. maximum hemoglobin level of 20mg/dl. endotoxin free and cell culture tested medium for primary cells. Store at 2 -8°C . -simple and rapid plate coating procedure. -enhance cell attachment in a variety of primary cells. formation of ammonia as a degradation product. product can be used as a nutrient supplement in cell cultures. Solution, with Phenol Red and without Ca2+ and Mg 2+. only. Not for drug, household or other uses. stable for 2 years at -20oC. DAPI螢光封片劑, 可以染核及封片同時進行, 不管您先前DAPI是後染5分鐘或是與二抗一起共染，現在都不用。 在最後封片時, 就完成染核動作!! lenti-hTERT,p53,Myc,Rb,Ras V12, SV40 T antigen誘導細胞不杇。. Escpecially developed for the efficient transfection of eukaryotic cells with RNAi oligo's. This transfection reagent is perfect for any of your RNAi transfection needs. RNAi knockdown experiments in a wide variety of cell lines (HeLa, HEK-293 etc). Highly specific and non-toxic transfection. This product is distributed for laboratory research only. Caution: Not for diagnostic use . ANAifectin™ is a transfection reagent specially formulated with multiple cationic polymers. 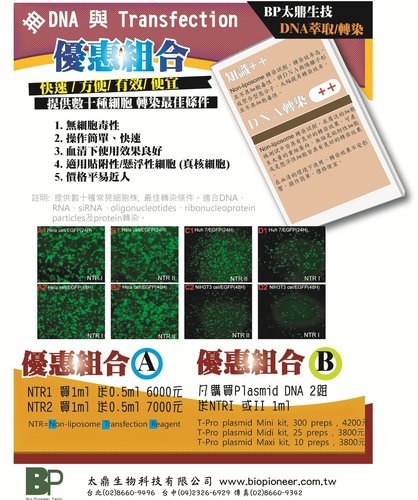 It is suitable for the transfection of RNAi oligoes into cultured eukaryotic cells. These conditions are recommended as guidelinesonly. A 6-well or 35mm dish is adequate for most applications, but larger vessels are sometimes required. In that case, consult table 1.
allow DNA-lipsome complexes to form. 4. Remove growth medium from the cells and add 800μl of serum-free medium to the cells. and incubate at 37°C for 2-24 hours. We recommend starting with 5 hours. 6. Remove the transfection solution and add 2.0ml of the appropriate complete growth medium(with serum) to each well. Incubate cells at 37°Cfor a total of 24-72 hours. 7. Assay cell extracts for gene activity 24-72 hours a􀄞er the start of transfection depending on the cell types and promoter activity. 8. A similar procedure can be used to transfect an RNAi vector for stable expression. At 72 hours a􀄞er transfection, split the cells at a ratio of 1:10 into the selective medium for the marker gene transfected.